Since time immemorial, wise men have used tools of nature to aid processes of change – and to bring the human being back into his life’s flow, thereby giving him a new higher order. CHAOS – the dissolution of old concepts of order – is always a companion in such growth steps. Similar to the transformation process of a plant that transforms into SMOKE and thus releases its actual healing power into the room, SOUND can act as a conflict-solver and support people in their holistic well-being. In moments when we are completely with us, we experience qualities without a past and a future. They are perfect moments of existence – without CONFLICT. The symbiosis of SOUND & SMOKE seems especially in NOWERTIME, with its huge overarching growth requirements, a successful way to support the conscious person on his life’s journey. This composition series offers deep transformational experience processes through SOUND in combination with selected incense mixtures. The 2nd co-production of the composer THOmas CHOchola and the incense manufactory LAB.DANUM. THO CHO mixes in this sound work nature voices from the bird kingdom with melody clusters from his soprano saxophone and delicate piano chords. The vibration patterns are tuned to auditory areas, which are usually no longer perceived with increasing aging of humans. Through frequent listening to the composition, these fine listening areas can be stimulated again and a regeneration of exhausted receptor systems in the inner ear can be supported in order to regain their sensitivity. In particular, the composition OLIBANUM in combination with an OLIBANUM fumigation supports the connection of head and heart intelligence. This can support a loosening of old patterns of behavior and thus bring about new solutions for everyday problems. A composition of natural sounds, digital piano and acoustic bass accompaniment to harmonize the parasympathetic nervous system (vegetative nervous system). This piece should be played in the wake of the OLIBANUM experience to support activated processes in their processing (brainstem). ATTENTION ! Very intensive transmission of INFORMATION of dense sound structures, which aims to detect obsolete embossing patterns and release jammed energy. While working with white Copal, attention should be paid to conscious deep breathing. Strong emotions can be triggered or solved! Labile people should listen to this composition in the company of a trusted person in order to communicate and learn to accept their experiences. 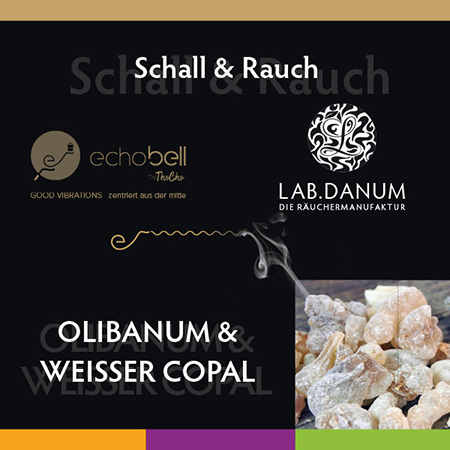 A composition that supports the processing of the intensive experiences that can arise when working with WHITE COPAL. In a sense of security reflect the emerging images and let them set. 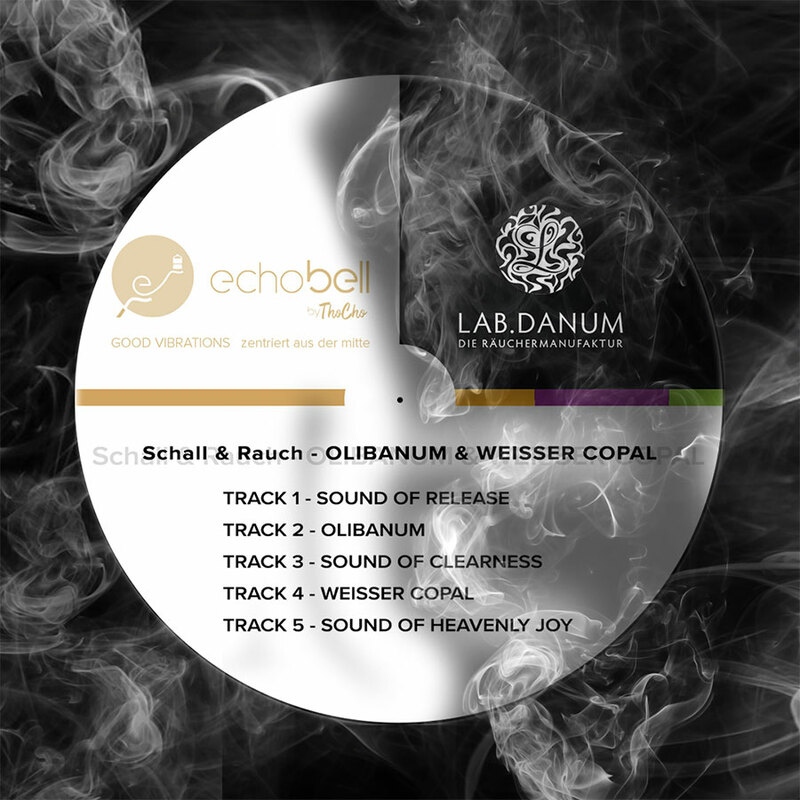 These delicate melodic sound clusters are made of natural sounds and digital instruments. The founder of the incense manufactory LAB.DANUM, Christine Fuchs, is a successful author. You can find detailed literature and information about the various possibilities of the usage of frankincense and white copal at www.labdanum.com. THOmas CHOchola can be found at www.echobell.at. 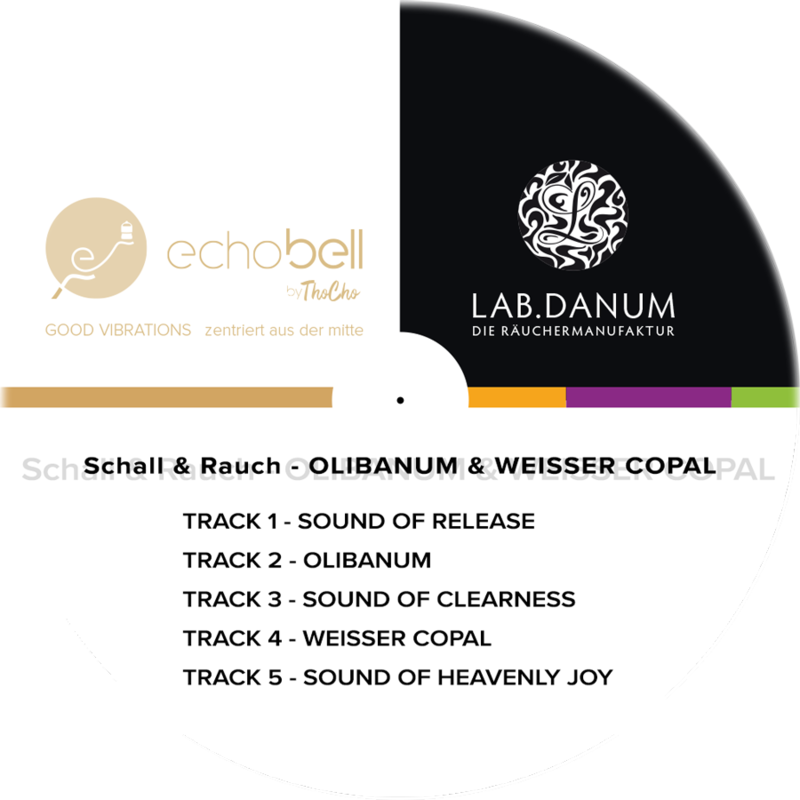 His current invention – the echobell – a special mobile player that eases mental, emotional and physical tension – is suitable, among other things, for the sustainable processing of the awareness and insights, which arise in the course of the sound experience with the present CD.